ImageOptim is software that makes me happy. It’s a simple install, does one thing and does it well: it tries to reduce the size of image files losslessly. Drag-and-drop to get ≈70% reduction in file size? Yes. Of course, the amount of compression you’ll get will depend on a lot of factors, most of which you and I never tried to understand. And if we understood them, we could manually feed the right parameters to the compressors that ImageOptim uses. It never hurts to see if I can squeeze out a little more: ImageOptim won’t modify the image unless it can compress it. 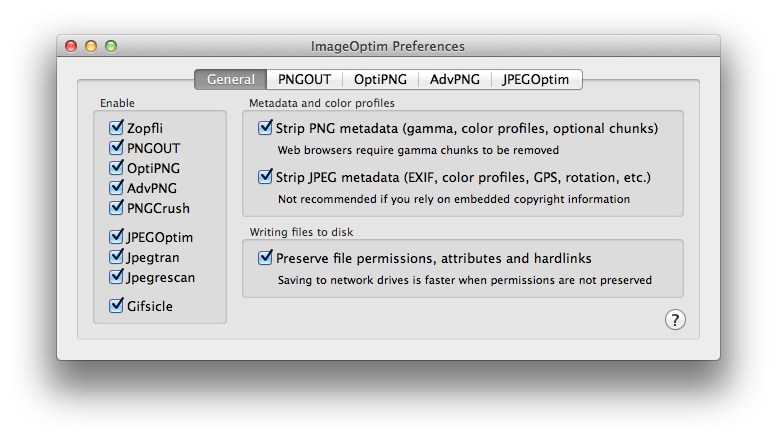 One warning: ImageOptim modifies files in-place. If you have “master” files, I would recommend making copies and working off of those (always a good idea).